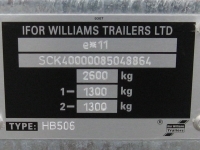 West Wood Trailers Present The All New TT3017 From Ifor Williams. The all new, next generation tipping trailer from Ifor Williams. The TT3017 is the replacement for the TT105 with brand new features including, increased payload, improved side panel design, double hinged rear tailboard and storage box for the tipper control unit. The Ifor Williams TT3017 (10' X 5'6'') Tipper trailer comes with optional extras such as additional ramp stowage, 8' steel ramps, prop stands, light guards, lashing rings, winches and mesh side kits and a ladder rack.